Here you will find most of my video works for the Alpha games series but with special emphasis in the second installment of the saga, ZERO 2. April 05 2015: SFA2 Hitboxes Data added: Here! June 16 2014: SFA2 Final Combo Video Leftovers added: Here! 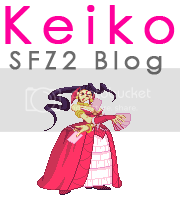 April 06 2014: SFA2 Keiko & Izumojin Combo Video VOL.04 Added: Here! May 09 2012: SFA3 Upper V-Fei Long Stuff Added: Here! May 05 2012: SFA3 V-Gouki Combo Stuff Added: Here! March 23 2012: SFA2 Nash Conditional Combo added (Extra chapter) Here! March 20 2012: Keiko Combo Video Series now available on Nico Douga! March 01 2012: Articles Page added! Click Here. February 08 2012: A2 Adon Character Combo Review (Ep.06) Added! *New* Click Here! February 05 2012: A2 Birdie Character Combo Review (Ep.o5) Added! *New* Click Here! February 05 2012: New Site officaly launched!